Three men enter a mysterious 'zone' in search of enlightenment. What does it all mean? I can't answer that. You'll just have to journey into The Zone, if not The Room, yourself. This Stalker makes for an effective guide. Andrei Tarkovsky's 1979 sci-fi classic has had a troubled history of home entertainment releases. This new blu-ray edition from Artificial Eye has its share of issues too; visually it's soft in many places, with minor print damage visible throughout, while its audio is of the Rice Krispies variety, all snap, crackle and pop. 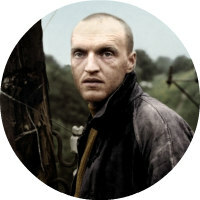 It's as though the only existing print of Stalker was retrieved from its own contaminated zone, but nevertheless, this is probably the best the movie will look and sound for now. Loosely based on the novel Roadside Picnic by Boris and Arkady Strugatsky (currently in the process of being adapted for a 2017 US TV series), Stalker takes place in a small, unnamed Eastern European country, an area of which was either hit by a meteorite or possibly even visited by alien life. The area, now known as 'The Zone', was left contaminated and sectioned off, surrounded by police barricades. With rumours of a section of The Zone, known as 'The Room', containing the power to grant the wishes of visitors, some are keen to embark into The Zone, led by men known as 'Stalkers', who help them negotiate the deadly journey. One such stalker, played by Aleksandr Kaidanovsky, ignores his wife's pleading and sets off with two wealthy clients in tow - a writer, (Anatoli Solonitsyn) who hopes The Room can cure his mental block and provide creative inspiration, and a professor (Nikolai Grinko), who dreams of making a scientific discovery. Whether the Strugatsky brothers were inspired by L Frank Baum's Wizard of Oz for their original novel is unclear, but there's no doubt the 1939 Hollywood treatment influenced Tarkovsky's adaptation; the movie opens in sepia tones, transforming to colour once the protagonists enter the zone. It could be argued that both the professor and the writer are in search of both a heart and a brain, but ultimately they are rendered as cowardly lions lacking courage, or in this case, faith. Tarkovsky was known for mocking the communist society he somehow managed to thrive in, and through the stalker, the only character who possesses faith, he scorns the atheism of the professor and the writer, and of Russia itself. This may prove a stumbling block for some viewers in this modern age where religion arguably poses a far more explicit threat to the world than communism, an ideology practically on its death bed, but keep in mind how we always want what we're denied, and you'll begin to sympathise with the stalker's beliefs, even if you do find them ideologically unsound or naive. It's impossible to view Stalker today without thinking of the Chernobyl disaster and the ruined landscape it left behind. Shot around the ruins of a deserted power plant in Estonia, the movie has a uniquely murky and unsettling aesthetic. Foliage grows through the skeletons of abandoned tanks like corpses impaled on spikes, rain seems to fall in oddly specific patches, and sand dunes materialise like reverse mirages in the otherwise green and grey landscape. Owls appear and disappear, while a black dog (considered a symbol of fear and anxiety in popular dream interpretation) observes the human intruders as though passing distant judgement. Eduard Artemyev's electronic score, humming like an electric cable in a quiet field, is quietly disquieting. Interview with Cinematographer Aleksandr Knyazhinsky. Interview with Set Designer Rashit Safiullin. Andrei Tarkovsky's Metaphysical Dream Zone: Selected Scene Commentary by Psychoanalyst Mary Wild. Stalker is available on blu-ray and DVD from Artificial Eye now.